The Portland Museum of Art Biennial, which opens on Oct. 3, is the art event that gets the most internal ink in Maine. One reason why there is so much Sturm und Drang surrounding the highest profile juried shows in any region is that such shows reach out to — and thereby implicate, for better or worse — every member of the entire artistic community. Detail of one of Hannah Barnes’ wall installation paintings. Jenny Dougherty’s gouache and ink works on paper. In anticipation of the PMA Biennial, I strongly suggest you visit the Maine College of Art’s handsome, hip and entertaining 2013 Alumni Biennial Juried Exhibition at the Institute of Contemporary Art. What’s particularly striking about the alumni biennial is that while it is a bona fide juried show, it acts like a curated exhibition. It is visually elegant and thematically coherent. Juried by Shannon Rankin, a well-known local artist represented by June Fitzpatrick, and Kate McNamara, the talented director and chief curator of the Boston University Art Gallery, the alumni biennial features a cast of just six fresh faces. None graduated before 2002 and one, Reesa Wood, finished her undergraduate studies just this year. And because there are only six artists, each gets ample space with plenty of breathing room. Jenny Dougherty, known locally as the associate director of Space Gallery, for example, gets the entire front gallery to herself. Her very strong framed gouache and ink works on paper are basically beige and black checkered grids that have been geometrically expanded and speckled with a full range of print tones: Pink, magenta, blue, acid yellow and so on. Dougherty’s two wall painting installation pieces employ the same visual logic, but only one uses an additional color element, puce — which imparts a smartly intentional but unappealing color vocabulary of a 1980s office cubical. Dougherty’s paper works are cut to turn the grid into a shape in such a way that uses the white of the backing paper (and wall) to create a complex relationship between geometrical idea and painterly object. 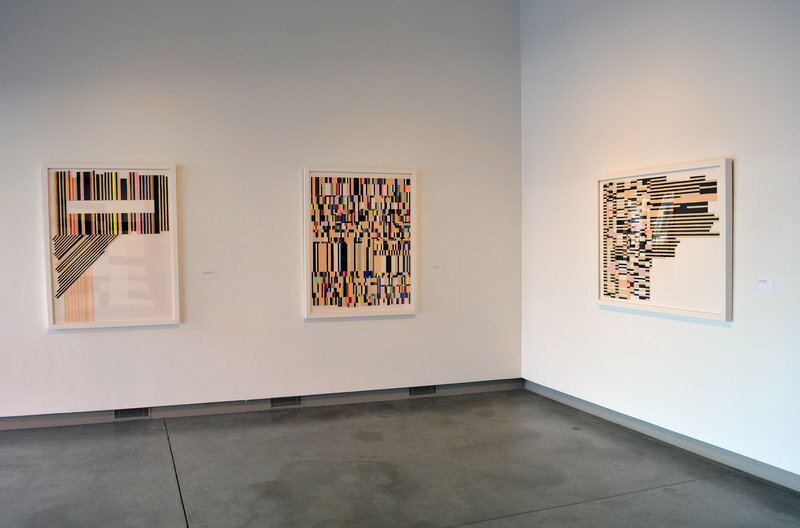 In the end, these pieces reveal themselves to be formalist works dedicated to visual sensibility rather than the game theory or system rubric whose vocabulary they borrow. Dougherty’s divided logic is taken even further by Rebecca Duke in her “Over the Rainbow” — what looks like a wood pile made of split logs colored with garish house paint. The irony is that the fluorescent tones of the paint make the logs look like real logs far more effectively than if Duke had tried to paint them realistically. Their camouflage is the covering logic of the paint — and the more obvious the paint, the more effective the camouflage. Duke engages the audience playfully, but with respect. Each piece is a foam cast of a real log, so the pile represents a huge amount of work. Duke’s four pieces along the walls of the ICA’s main gallery all feature impressive back-end depth, particularly her “Broken Hearts,” a four-piece, unfinished wooden panel whose four-by-four components are raw and cracked on the flat side facing the viewer and gorgeously polished and finished on the ends obscured by the angled outer edge. Her mesmerizingly mysterious video projection “The Wonders of Illusion” looks like dazzling lights through a car window in heavy rain (or the popping spots fading in or out of a concussion for anyone unlucky enough to know what that’s like). Shirah Neumann’s intelligent and engaging paintings have firmed up since I reviewed her December 2012 show at Aucocisco. A particularly strong piece from that show, “Circuits,” is here, but I prefer the more solid and stolid pattern-oriented works such as “Tavern,” which reads like a decoratively gridded book sitting on a patterned iron table. The exuberance of Wood’s intentionally ugly material-oriented paintings gives the idea she loves painting, and her indulgent affection contagiously makes her work easy to like. 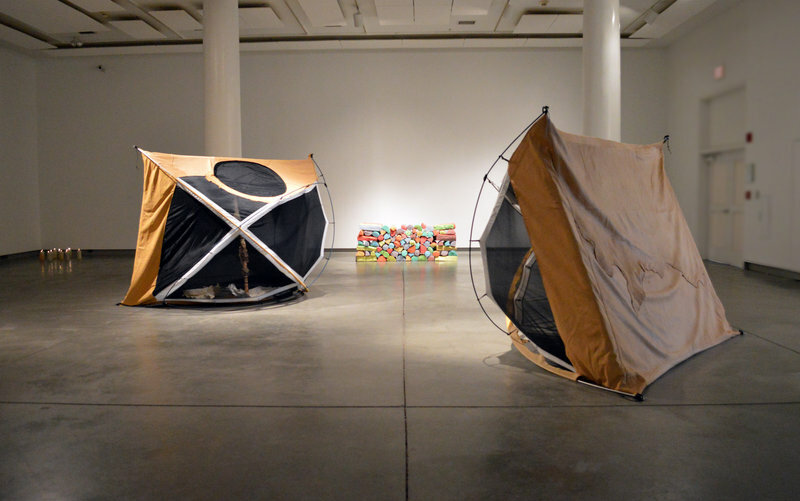 Gina Adams’ group of three tents, turned on their sides and covered with (mostly) hand-stitched leather, is the only work that doesn’t resonate with me. Her effort and skill are commendable, and the reading of modern tent technology back toward the fundamental and spiritualized survival existence of our ancestors seems a worthy project. But in the context of a here-and-now real-time show, the harkening logic of this piece doesn’t connect. 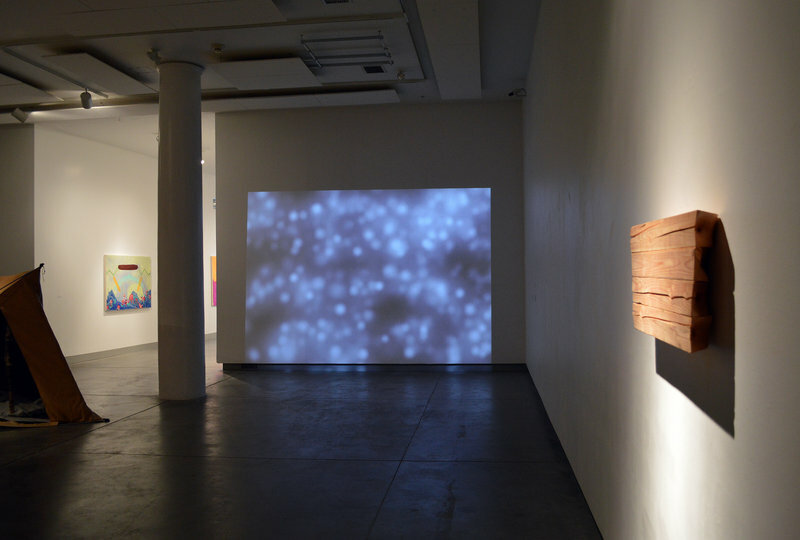 Hannah Barnes has two wall installation paintings that elegantly and brilliantly interact with the gallery where the remnants of ICA director Daniel Fuller’s “We are what we hide” project emerge from the walls. 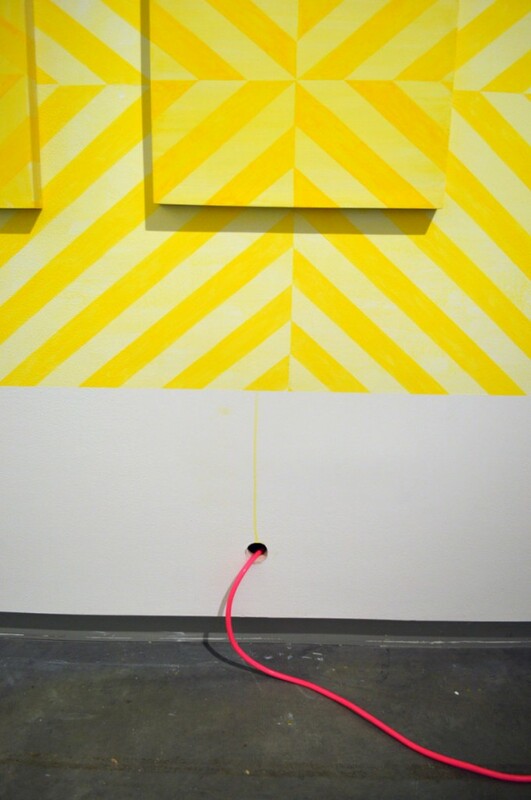 Barnes runs a liminal yellow line down from her dissected yellow wall painting to a thick pink extension cord from the wall project. The synapse logic is electric — literally. Barnes’ other wall piece plays further with the pink cord by echoing it with pink lines on the end wall that play the part of perspectival diagonals of a 3D box drawing. The pink lines not only force the question, “Is it a drawing or painting?”, but they make that question worthy even before you consider the conceptual art plot twists. It’s also interesting that two women jurors picked six women artists. While that seems a worthy topic for discussion, I commend the jurors and the ICA for “Ardor.” It’s a good show.